The Best Ski Resorts for Families! When you are twenty-something, single, and skiing every weekend, you pick ski resorts with swift lifts, snowmaking amps, and après ski bars. Once you have kids, the fall line formula changes to daycare ratios, learn to ski programs, and condos with kitchens and washing machines. Smugglers’ Notch in Vermont hoards the family ski resort awards every season and there’s a reason. Smugglers’ has a beautiful slopeside daycare, “Treasures,” for your baby starting at 6-weeks, so you can make some turns then check in on your child. Your little tyke can learn to ski as early as 2 ½ at Smuggs’ Snow Sports University. This Vermont resort rocks when it comes to kids of all ages, even the tough to please teens can “chill at Smuggs’ two teen night clubs. Parents will like the three interconnected ski mountains and the convenient village accommodations. Okemo in Vermont is a family owned and operated resort and you sense that when you bring your kids to Penguin Daycare, or SnowStars ski school starting at age 3. Okemo makes tons of snow, and their service from friendly liftees to exceptional on-mountain cuisine makes it a very pleasant mountain to ski and stay at. Bretton Woods in New Hampshire has spectacularly scenery, well-groomed slopes, and their Babes in the Woods Daycare and Hobbit Ski and Snowboard Camps are well-oiled (and all under one roof) for young families. 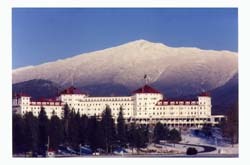 If mom & dad can splurge and stay at the century old, elegant Mount Washington Hotel, this makes for a grand ski getaway for the entire family. 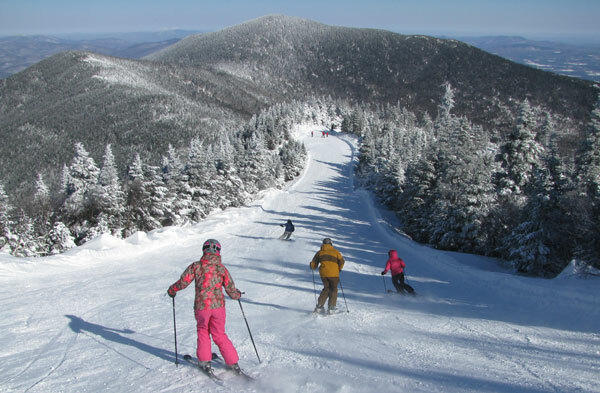 Maine’s Sugarloaf and Sunday River – now sisters under Boyne, both have slopeside daycare for tots and exceptional daily ski camps for youngsters to teens. Sunday River is a good choice early season, they make monstrous quantities of snow. The lift system is very efficient, and the two Grand Resort Hotels are convenient to the slopes, the outdoor heated pool, and family après ski including snow tubing and entertainment. Sugarloaf is worth the trip mid to late winter, your kids will love the Maine mascots, Amos the Moose, Blueberry the Bear and Pierre the Logger. Parents will love the culture of this northern Maine ski resort, good après ski pubs and good hearted people. In Massachusetts, Jiminy Peak has a custom built Children’s Center with daycare, ski and snowboard programs, and rental equipment all in one building – one stop family shopping and dropping (well, you know what I mean). Slopeside lodging and a manageable-size ski area with a speedy six-pack lift make Jiminy a good jaunt for flatland families. Now that your ski unit includes ankle biters, ask the parents on you block where they take their posse skiing. Be a choosey mom or dad, do your research to find the best fit for your family. Ski areas are catering to the littlest consumer in your clan – knowing that is the key to a great day or a fantastic family week on the slopes. Big Sky is a challenge to get to in Montana but once you get there this Montana ski resort is vast, very friendly and offers spectacular vistas from Lone Peak. Now that Big Sky interconnects with Moonlight Basin, you have the biggest skiing in America. Staying slopeside at Big Sky’s Summit Hotel, you can walk to the lifts, to kids ski camp and to the new plaza with skier services, shops and restaurants. Take a day to tour Yellowstone National Park -Old Faithful still goes off in winter, and the geysers and animals tracks are easy to spot in the snow. Vail is the big daddy of Rocky Mountain ski resorts. With over 5,200-acres of terrain, Vail makes our top ten ski resort annually. Golden Peak at Vail is the family ski hub, with A Small World Play School, Vail ski and snowboard lessons, and Vail ski camps near Vail Village where you find top lodging properties like Lodge at Vail, Four Seasons and the Sebastian. On the mountain, look for Vail’s Kids Adventure Zones. Vail Village has that European ambiance for your family to explore after a day on Vail’s Front Side or the Back Bowls. For Vail nightlife (family-style), look for the weekly free concert block parties at 6pm. Deer Valley ranks as the top ski resort for service, food and grooming, so not surprisingly this posh ski resort is great with families too – just no snowboarders. This first class ski resort in Utah has great lifts, excellent grooming and well trained ski ambassadors to make your ski and stay at Deer Valley the best. Warning: Deer Valley is pricey – you pay for what you get people. Deer Valley Condo lodging at the base, like the Silver Baron, is more affordable for families than the new Deer Valley St Regis Hotel, and Montage Hotel at Deer Valley, or the classic Stein Erickson lodge at mid mountain. Aspen Snowmass is the largest of the four Aspen ski mountains, skiing the Big Burn at Snowmass will make everyone in the family feel like the big cheese – or a ski movie star. With lodging at the recently revitalized Snowmass Village, and the state of the art Tree House child care center – Snowmass is ideal for families. Snowmass is the second largest ski resort in Colorado behind Vail. Aspen’s Buttermilk is teen heaven in January when they host the trendy Winter X-Games. Siblings Aspen Highlands and Ajax in downtown Aspen are also worth a day of skiing during your family ski week in Aspen. Steamboat is a Wild West cowboy resort with a tame side for families. Steamboat’s ski terrain isego pleasing and scenic with some steeper glades tucked away too. 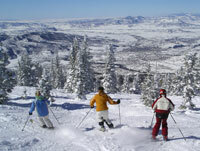 Steamboat’s snow and sun are plentiful – so called Champagne powdert, and the on mountain accommodations include a Sheraton and the Steamboat Grand. Steamboat’s Village at the mountain is newly ramped up, while the downtown Western town, just a short drive away, is Cowboy heaven. Take your family to Strawberry Park Hot Springs for après ski soaking in the natural hot springs, and don’t miss a chance to ski with Billie Kid and race him in NASTAR – the retired Olympic ski racer is the ambassador here, still skis in his cowboy hat. Northstar is the place to ski in California for families – plenty of lodging, kids programs and terrain parks – like the all natural Burton terrain park called The Stash. Northstar also boasts plenty of Lake Tahoe California sunshine and stellar views. Northstar’s resort village is very inviting. 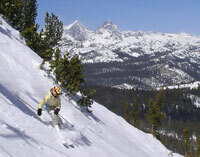 The Northstar Ritz Carlton provides posh mountainside lodging with a ski valet and spa. This Lake Tahoe ski resort is a good choice for a winter family ski trip, and you can day trip to Lake Tahoe, Squaw Valley and Heavenly.